Old Brodleians claimed their first Yorkshire One derby win of the season, at the fifth attempt, with a 24-13 home win over Old Crossleyans yesterday. They put the hurt of defeats at the hands of Heath (twice), lowly Old Rishworthians and the Crocs by 18-13 at Broomfield in October behind them with a display of determination and character. The third-placed Crocs looked favourites when they turned round only 10-6 down, with the advantage of the famous Woodhead slope and breeze to come, but Brods scored two converted tries to the visitors’ one in the second half for a deserved success. The game featured some tremendous defence from both sides. Home coach Ollie Akroyd described the success as a “relief”. Crocs had a superb 2018 and led the table after the first three months of this season but have now lost three out of four in 2019. Their coach Gareth Greenwood reiterated that his side had performed above themselves earlier and were only entitled to be a mid-Yorkshire One side. Brods won back the ball from the kick off and shortly after their No 8 Rob Jennings, the game’s outstanding player, broke through and headed for the try line but was brought back for a forward pass. The scrums were a shambles in the first half. When Brods were ruled at fault at the first of them, Crocs’ talented back line moved the ball quickly for speedy winger Josh Hunt to make ground. Stand off Joe Gallagher then made a break and a penalty award allowed visiting full back Callum Dunne to draw first blood with a three-pointer from the 22 metre line after seven minutes. Phil Town floated over a 35 metre effort to make it 3-3 and Brods, although hindered by a couple of Pete Williams knock-ons, continued to push forward in the Crocs half. A couple of penalties to the visitors led to a lengthy spell of play up the other end. Rugged forward Mark Boothroyd was adjudged held up over the try line and Harris Morris made a decisive tackle on the dangerous Dunne before Town’s clearance to half-way lifted the siege. Brods took the lead against the run of play when Town took a delayed flat pass and burst through from 20 metres out, adding his trademark swallow dive finish. 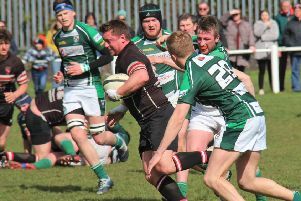 He added the goal for a 10-3 lead but handling in the ruck allowed Dunne to thump over a 40 metre penalty at the end of the half. Crocs must have been confident of coming through to win but Brods often play their best rugby against the slope and they showed a steely resolve. Things started to go wrong for Crocs when the referee over-ruled both touch judges and decided that Dunne’s 45th minute penalty had gone wide. As Crocs struggled to crack the home defence, Brods broke away to extend their lead. Scrum half Jimmy Hodkinson scampered 50 metres down the middle and when Michael Briggs emerged unchallenged with the ball from a ruck, Dunne was unable to prevent the winger from touching down. Town’s easy kick made it 17-6 on 56 minutes. Crocs were quick to respond, all-action forward Ryan Hammond forcing his way over from a tapped penalty and Dunne converting to set up an exciting final quarter. Brods proved to have the greater mental strength and as errors crept into Crocs’ play, American prop Bennie Pritchett got the clinching score at the foot of a post with around 12 minutes left. Town converted. The home side monopolised possession late on and might have had another try but their driving maul was held up.